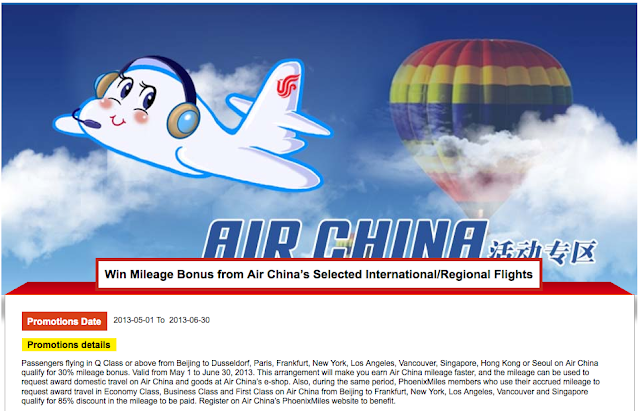 Rewards Canada: Air China: Only 15,000 Phoenix Miles for Business Class Award Ticket from Vancouver to Beijing? Air China: Only 15,000 Phoenix Miles for Business Class Award Ticket from Vancouver to Beijing? I found this offer over the weekend as part of Air China's new bonus for flying on many of their long haul routes and several regional ones too. It only takes up the last half of the promotional paragraph but if this is true, this is a huge redemption discount for flights! According to the wording on the page, Phoenix Miles members can enjoy an 85% discount on award tickets between Beijing and Frankfurt, New York, Los Angeles, Vancouver and Singapore until June 30, 13! You do have to register for the offer to partake in it. That means for flights between Vancouver and Beijing you only have to redeem 21,750 Phoenix Miles Kilometers for First Class, 15,000 Phoenix Miles Kilometers for Business Class or 9,000 Kilometers for Economy Class! This seems too good to be true, perhaps their translation of the Chinese page for the offer meant you can get the ticket for 85% of the original cost or in other words a 15% discount. I am going to do some more digging on this one but it may be worth taking a look at! If this does turn out to be the amazing deal it sounds like then the best bet to get Phoenix Miles Kilometers is to transfer Starwood Preferred Guest Starpoints at a 1:1 ratio (and of course 5,000 bonus Kilometers for every block of 20,000 converted). I'll try to keep you updated on this offer and/or if you can find out more details please post them below in the comments..